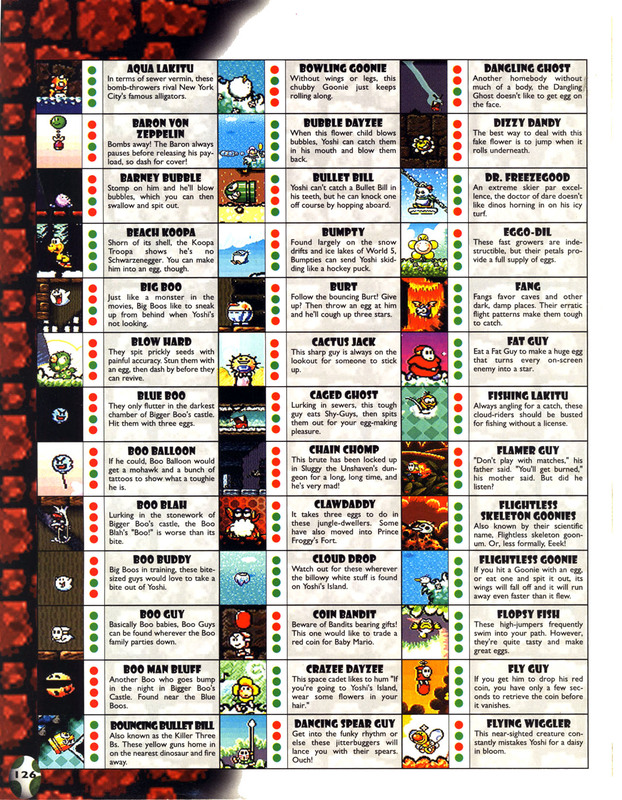 Bumpties are a race of penguin-like creatures that first appeared in Super Mario World 2: Yoshi's Island. They are usually found in icy regions. Most Bumpties are blue—however, pink and green individuals were shown in Paper Mario. Their name is a corruption of "bumpy", referring to their bouncy, rubbery feathers. Bumpties are usually found wandering around in icy areas of Yoshi's Island in their debut game, Super Mario World 2: Yoshi's Island. While Yoshi can grab Bumpties with his tongue, he cannot eat them. Also, if he runs into one, he is bumped backwards, hence the name. This means that Bumpties can't hurt Yoshi. Their official artwork depicts them as a more purple shade of indigo. They can also steal Baby Mario if Baby Mario has already been knocked off Yoshi and is floating towards one, like a Bandit. A certain Bumpty appears only in the SNES version of Tetris Attack, allied with Dr. Freezegood. In here, he is depicted as Yoshi's friend, but enchanted by Bowser and his minions to work for him. Yoshi and Bumpty become friends again after freeing him and Dr. Freezegood from the spell. He also notes in the game, that others say that he's cute, but he really doesn't like it, and would like to be said as cool. Bumpties reappear in Stage 3-4: Frustration in Yoshi's Story. They still repel Yoshi if run into, but they can be eaten. They also appear in Yoshi's Island DS in Baby Bowser's levels. Here they can be defeated simply by blasting them with one of Baby Bowser's fireballs. In Yoshi's New Island, Bumpties appear in World 5-1, Brave the Bumpty Blizzard. They are colored purple, similar to their original artwork, instead of blue. Unlike previously, they will not steal Baby Mario if he has been knocked off Yoshi's back. In Yoshi's Woolly World and Poochy & Yoshi's Woolly World, Bumpties can be eaten, but not converted into a Yarn Ball, instead being spat out. They will bounce Yoshi away if they hit him. They appear only in the levels Big Montgomery's Ice Fort, Snowy Mountain Lift Tour and Wonderful World of Wool. Bumpties reappear in Yoshi's Crafted World, notably being summoned by Burt the Ball in the boss fight against him in Burt's Bouncy Battle. They also appear as basic enemies in Chilly-Hot Isles. 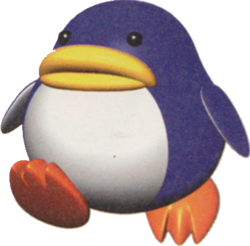 Bumpties in the Paper Mario series are referred to as penguins, and speak with stereotypical Canadian accents. Bumpties return in Paper Mario. 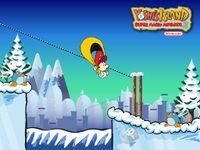 In this game, Mario travels to a city of Bumpties called Shiver City. He also meets a famous writer named Herringway who is a Bumpty. In this game all the Bumpties are allies, not enemies. A small group of Bumpties (Including Mayor Penguin) appear in Princess Peach's Castle prior to the arrival of Bowser. Bumpties also make a small appearance in Paper Mario: The Thousand-Year Door where they live in Poshley Heights, a town of the rich and famous. Mario also meets an incompetent detective Bumpty named Pennington. Bumpties also appear in Super Mario Advance 4: Super Mario Bros. 3, only appearing in the World-e level Slip Sidin' Away. The sprites are exactly the same as in Yoshi's Island, but with a slightly-different palette. Players cannot harm them unless they use a Fire Flower or Hammer Suit. If players try stomping on it, they are bounced off, and if they touch it from the side, players will not be harmed, but they will be knocked off to the side. French Pinboing From "pingouin" and "boing"
The official wallpaper of World 5 from Yoshi's Island: Super Mario Advance 3 released by Nintendo features the official artwork of Raphael the Raven, but shrunk and recolored to resemble a Bumpty. This page was last edited on April 8, 2019, at 13:55.